Once upon a time America fought a great war to rid the world of the Nazis, but now we have become just like them. 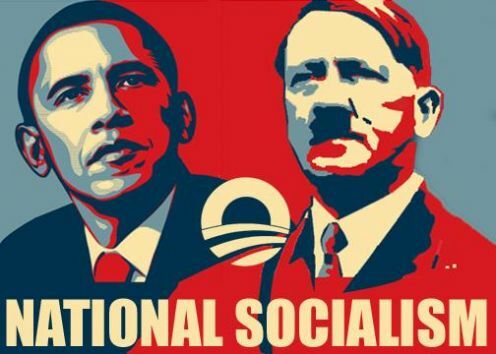 In fact, I would venture to say that the Nazification of the United States is pretty much complete. As you will see below, we have a heavily socialized economy where tax rates are out of control and lots of freebies are given out just like the Nazis did. And just like the Nazis, our society has become highly militarized and our government has become increasingly obsessed with watching, tracking, monitoring and controlling the general population. But more than anything else, all of the pageantry and beauty in our society masks an evil which has grown to a level that is almost unspeakable. The other day, my wife and I were watching some footage of the beautiful parades and celebrations that were held in Germany before World War II, and they certainly were very impressive. But under the surface, a great evil was growing. Just because something happens behind closed doors does not make it okay, and just like the Nazis, our society is about to learn an exceedingly painful lesson in that regard. I knew there was a reason why I always liked that guy. I like free stuff too, but in the end someone always has to pay for all of that free stuff. According to Kitty Werthmann, “our tax rates went up to 80% of our income“, and in America we are moving in the same direction. Not even Barack Obama or Bernie Sanders would make such an extreme statement today. And like the Nazis, our society has become highly militarized. Just prior to World War II, the Germans probably had the most powerful military on the entire planet, and they loved to use that military to push other countries around. They stunned the entire world when they swept through Poland, and the lightning speed with which they defeated France changed the way war is waged forever. And just like the leftists of today, the Germans were extremely suspicious of individual liberty and freedom. The secret police were everywhere, and anyone that was even suspected of anti-government activity was monitored very closely. Sadly, we are becoming just like the Nazis in this regard, only now we have the technological capability to take things so much farther. Government control freaks are systematically watching us, tracking us, recording our phone calls and monitoring our emails. It has gotten so bad that even 64 percent of all reporters believe that the government is spying on them. We spy on our enemies, we spy on our friends (just ask the French and the Germans about this) and we even spy on the little old lady down the street. We have been sold the lie that we have to give up our privacy and our liberty in exchange for security. It is the same lie that the Nazis told. But perhaps our greatest similarity to the Nazi regime of the 1930s is our lust for blood. What the Nazis did behind closed doors was so horrific that it is hard to even speak about it. Once the Holocaust was revealed, the world should have never allowed crimes against humanity like that to ever happen again. They are happening behind closed doors in America today, and most Americans are perfectly okay with this. In this country, millions of babies are being systematically murdered and their organs are being harvested. Those organs are then sold off to the highest bidder and they are ultimately used in extremely bizarre scientific experiments. In recent months these crimes have been put on display for all the world to see, and yet the American people have not responded with outrage. In fact, only 29 percent of Americans even want to cut off the hundreds of millions of dollars that Planned Parenthood is getting from the federal government every year. Do you know what that 29 percent figure tells me? It tells me that America is done. Of course those on the left are going to get very upset by all of this, and I am sure that some of them will leave some very nasty comments following this article. And it isn’t just Democrats – most Republicans in Congress are in the exact same boat too. What will the fate of America be? If I Deny Christ, Can I Still Go to Heaven?